Michel Guerard’s recipe for a delicious and easy warm tomato tart is the perfect way to use up the last of the summer tomatoes and basil. 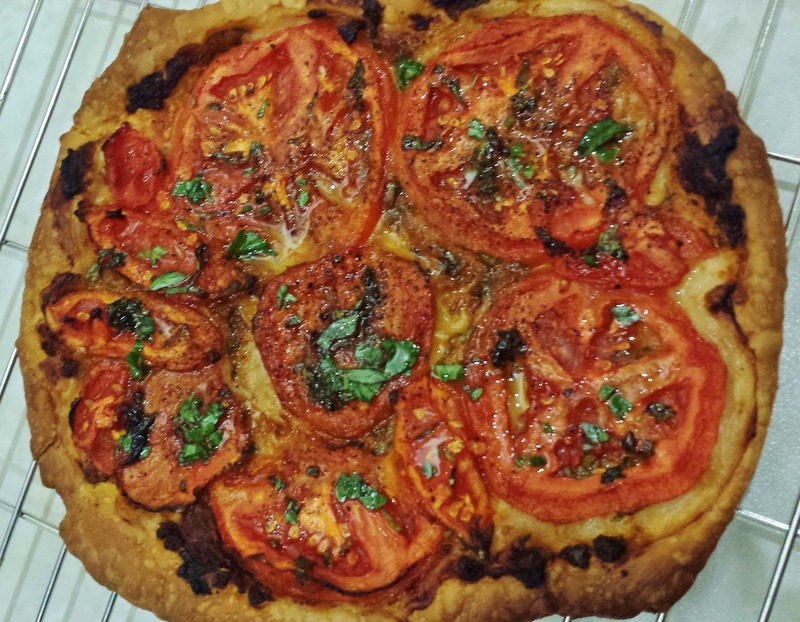 Adrienne loved Michel’s food and loved tomatoes – so this is a match made in heaven! I think plum tomatoes work best. If you can find good beefsteaks go for it but be sure to remove all the seeds and liquid or you will end up with a soggy crust. Chef Michel’s tart is pictured above. Mine was not quite so pretty but definitely tasty. 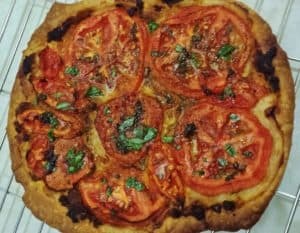 Michel Guérard’s recipe for a delicious and easy tomato and basil tart is perfect way to use up the last of the summer tomatoes. Step 2 Divide the puff pastry into 4 quarters and shape into balls. Using a rolling pin, roll out each ball into a circle 14cm (5½-6in) in diameter and 1mm (1/16in) thick. Put the circles on 4 squares of baking parchment, cut to 16 (6 ½ in) cm square each. Refrigerate while preparing the tomatoes. Step 3 Peel the tomatoes by blanching them for a few seconds in boiling water, then refresh in cold water. Peel the skin off with your fingers. Step 4 Chop the basil leaves finely with a knife and mix with the tomato concentrate paste. Spread the tomato-basil mixture onto the puff pastry disks, leaving a ½ cm (¼ in) border (the trottoir or ‘sidewalk’ of the tart). Step 5 Cut the peeled tomatoes into slices of 3 to 4mm (1/8 in) thick. Tap them lightly to get rid of the seeds and water. 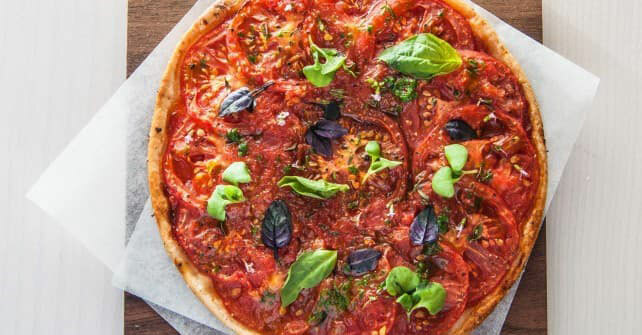 Carefully lay the tomatoes in concentric circles on top of the tomato-basil mixture. If there are empty spaces due to the missing seeds, fill them with pulp from another tomato slice. Step 6 Pesto: place the leaves of the second handful of basil in a food processor along with the olive oil. Process until you have a smooth paste. Set aside. Step 7 Sprinkle the fresh thyme onto the tarts and season with salt and pepper. With the tip of a sharp knife, score the pastry around the ¼ inch perimeter so that the edge of the pastry will rise. Place the tarts and the squares of baking paper on the preheated baking pan in the oven. Cook for 10 minutes or until the pastry is golden and slightly puffed. Remove from oven and brush the tarts with half the pesto mixture. Return to the oven for 5 minutes until the tarts have browned. Step 8 Place each tart on a warm serving plate. Brush with the remainder of the pesto and a few small basil leaves.